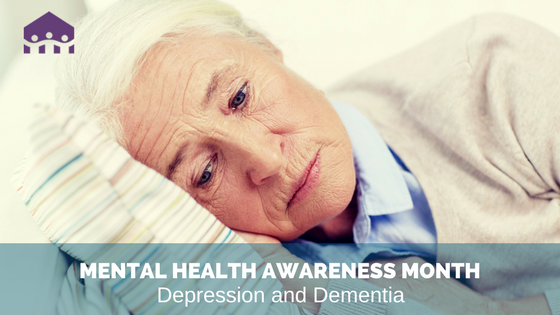 May is Mental Health Awareness Month and we would be remiss if we didn’t take some time to discuss how mental health issues can affect those living with dementia and their caregivers. Depression is commonly associated with Alzheimer’s. Experts estimate that up to 40 percent of people living with Alzheimer’s disease suffer from significant depression. Identifying depression in someone living with dementia or Alzheimer’s isn’t always easy, but it’s important that family and caregivers keep an eye out for the symptoms of depression and seek help if they suspect their loved one may be depressed. Many symptoms of Alzheimer’s mimic the symptoms of depression, such as apathy, social withdrawal, isolation, difficulty concentrating, and loss of interest in activities. Someone with dementia who is also suffering from depression may experience sadness, hopelessness and guilt, among other feelings, but they will often find it difficult to articulate these feelings due to cognitive impairment as a result of the dementia. Depression in someone with dementia may be less severe, or have symptoms that come and go. It isn’t just those living with dementia who are susceptible to depression. Many caregivers also experience depression. Caregiving for someone living with dementia is a hard job and it can lead to feelings of stress, guilt, anger, sadness, isolation and depression. Sometimes caregivers experience depression right after their loved one is diagnosed with dementia, while others may experience it as the cognitive abilities of their loved one diminish. If you or your loved one living with dementia is experiencing any symptoms of depression, please seek help from your physician as soon as possible.